Everyone can play for a chance to win! We want to make sure that all of our visitors have a good time and get a shot at winning at Mykonos Casino. That’s why we are running our Spin the Tables promotion for Rewards and non-Rewards members alike from 6 February until 27 March 2019. That means everyone who plays Tables at Mykonos Casino stands the chance to win a share of R40,000 in prizes in our weekly Wednesday draws! Great way to kick off the month of love, wouldn’t you say? 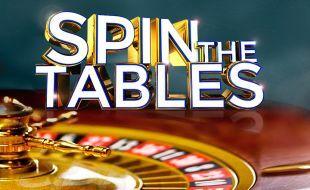 New Rewards members and non-members can participate in the Spin the Tables promotion. To qualify for draw tickets, you have to be present and place a valid wager on one of our Table games on the day of the promotion. Spin the Tables starts at 20h00 and will run until 22h00 on draw days. Numbered balls (from 0-36) will be placed in a promotion draw bag. When the dealer calls “no more bets” the promoter will draw 2 numbered balls from the bag and call out the numbers. All bets straight up on these numbers will earn a ticket for the draw. Only one ticket per person per spin, per draw. Tickets are only valid per half an hour for drawing times at 20h30, 21h00, 21h30 and 22h00 only one ticket per half an hour can be obtained by the player. Four oversized cards, each with a different suite, will be held at the Blackjack table. The promoter will draw a card every 10 minutes. When the dealer’s card is the same suite as the promoter’s cards, all the players will earn a draw ticket. Only one ticket per hand, even if all cards are of the same suite. One ticket per player per hand, per draw. Tickets are only valid per half an hour for drawing times at 20h30, 21h00, 21h30 and 22h00 and only one ticket per half an hour can be obtained by the player. Four oversized cards, each with a different suite, will be held at the Poker table. When the dealer’s card/cards are the same suite as the promoters’ card, all players will earn a ticket draw ticket. One ticket per player, per hand, per draw. Tickets are only valid per half an hour for drawing times at 20h30, 21h00, 21h30 and 22h00 and only one ticket per half an hour can be obtained by the player. Draws will take place at 20h30, 21h00, 21h30 and 22h00 on Wednesday evenings and the draw bin will close five minutes prior to the draws. At each draw time, two winners will be selected and a total amount of R5,000 in prizes is up for grabs, per date. Any person who has been issued with a Refusal of Entry order, or who is self-excluded, or who falls into category of excluded persons, is expressly prohibited from participating in this promotion. As per Management discretion, participants are entitled to only one prize per draw time. A re-draw will take place if the same guest is selected as a winner during the same draw time. A participant is allowed to win once at each draw time at 20h30, 21h00, 21h30 and 22h00. Tickets are not transferrable, as prize winners can only win once per draw time. All tickets will be removed from the bin after each draw time. Tickets are only valid per half an hour for drawing times at 20h30, 21h00, 21h30 and 22h00 and only one ticket per half an hour can be obtained by the player. Prize Winners will be selected by means of a random draw. Draw times, dates and points criteria to earn tickets, will be advertised through approved advertising mediums used for this promotion. Guests can only earn tickets on the Poker, Roulette and Black Jack Tables. The draw bin will closed on Wednesday evenings 5 minutes prior to the draws at 20h30, 21h00, 21h30 and 22h00. A breakdown of the prizes will be available at the Customer Service Desk and announced prior to the draw. All prize winners need to show a valid form of Identification document or Passport or Driver’s Licence. All Participants are required to be present on the respective dates/times to be eligible for a Prize: Provided that if a participant elects not to be present in person when the winner/s are announced, the participant may nominate another person who has been duly authorized in writing to attend the draw on behalf of a participant in the form and manner determined by management, the details of which will be available at the Customer Services Desk. Participants or duly authorized representatives shall be required to present themselves within 90 seconds from the time of announcement, and must produce the valid ticket entry and positive and acceptable form of identification e.g. a South African I.D./South African Driver’s License/Passport or other official form of identification as approved by the casino and any other details as required. A redraw will occur should participants not present themselves within 90 seconds. Prize Winners who are present will be given 90 seconds to present themselves and must be in possession of evidence of the winning receipt. They must present their SA ID document or Drivers Licence. If they do not have the identification in their possession, then their identity can be verified on the EMS player’s database (soft copy of ID or Drivers Licence). If their identity cannot be verified, then they will not be eligible for a prize and a re-draw will take place. Authorized representatives or a participant shall not be entitled to any prizes and shall not take receipt of prizes accruing to the Participants they represent. Prizes are to be collected and signed for receipt thereof by the relevant Prize Winner (not representative), as the case may be, within 15 days from the date of the draw from the casino where the prize(s) were won. The prize winner must claim the prize at Mykonos Casino within 15 days of the draw. All decisions of Mykonos Casino will be final and binding and no correspondence or appeals will be entered into. In the event of technical failure or damage to the devices used for the promotional draw, irrespective of the cause, another suitable device or method will be used, at the sole discretion of Management. The Board will be notified of a new device that will be used. Any complaints and/or disputes can be lodged to the Western Cape Gambling and Racing Board.